Workhorse. The 730U3E ultrabook is a new member of Samsung's Series 7 Ultra family. A first-rate metal casing, swift hardware, a matte Full HD IPS screen and agreeable input devices are its initial key specs. We tested the model featuring 256 GB flash memory for 1349 Euros (~$1761, RRP). 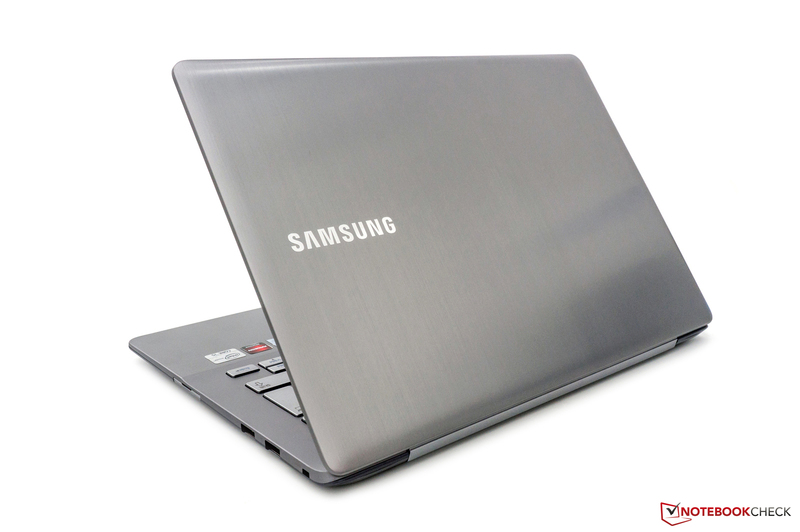 Samsung's Series 7 Ultra 730U3E was officially introduced at the Consumer Electronics Show 2013 in Las Vegas. We had a second opportunity to examine the ultrabook at the MWC 2013 in Barcelona. The positioning as a premium device quickly becomes obvious when looking at the South Korean manufacturer's product range. 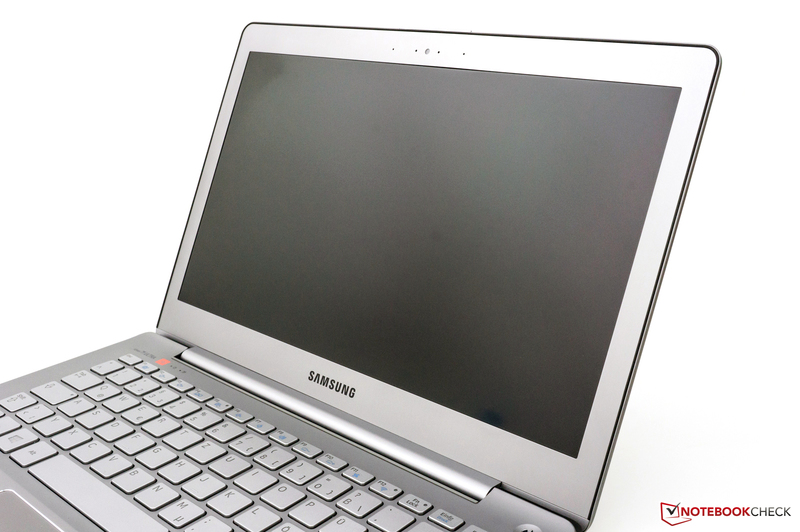 The devices are placed above the Series 5 (review: Samsung Series 5 540U3C) but still below Series 9 laptops, which have also recently undergone a refresh with the 900X3E. Currently four different Series 7 Ultra models are offered in some countries. The models dubbed 730UE all feature a matte Full HD screen. The differences are found in the integrated processor and storage devices. We tested the 730U3E-S04DE, which is the most expensive model at a price of 1349 Euros (~$1761, RRP). It sports Intel's Core i5-3337U dual-core processor, AMD's Radeon HD 8550M, 6 GB of DDR3 working memory and 256 GB of flash memory. Interestingly, the 730U3E-S05DE that is powered by Intel's Core i7-3537U was sold for approximately 50 Euros (~$65) less at the time of this review (1299 Euros, ~$1696 RRP). 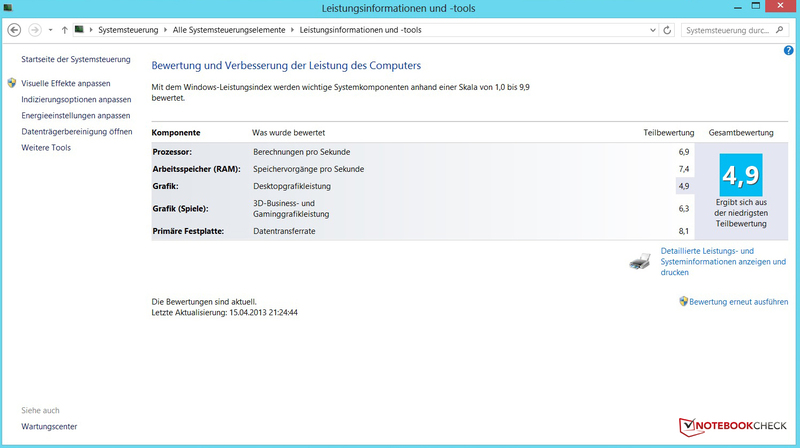 The 64-bit version of Windows 8 is used as the operating system. We would like to briefly describe the fourth Series 7 Ultra model here. The 740U3E-S03DE ultrabook offers the aforementioned i7 dual-core processor and a glare touchscreen for 1549 Euros (~$2023, RRP). The following chart lists the currently available configurations. 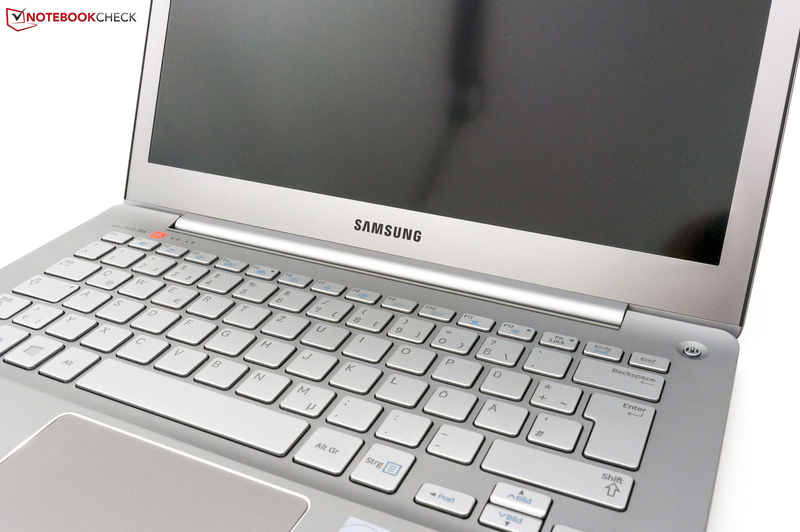 Samsung uses a consistent design language for its 730U3E. 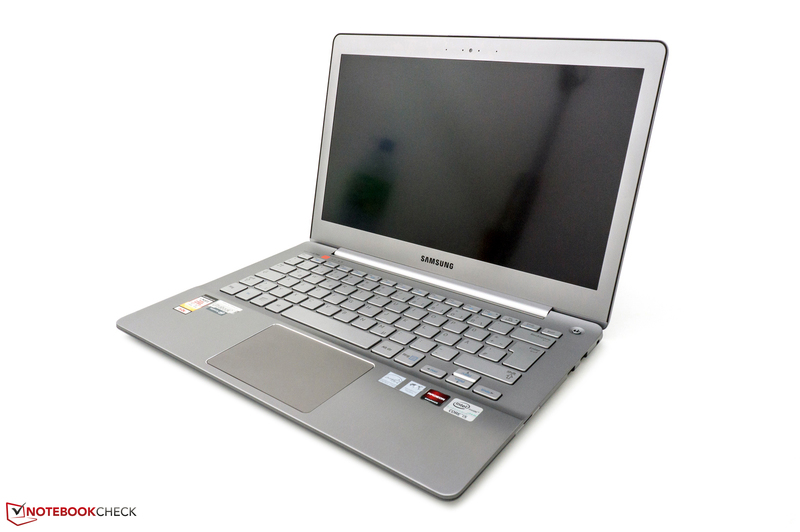 The ultrabook also resembles the larger Series 7 Chronos 770Z5E multimedia laptop. The casing is mostly made of aluminum. The ultrabook's color has accordingly been named "Metal". Besides subtle yet appealing looks, we particularly like the cool feel and the build of the single parts. The gaps are equally spaced throughout. We did not find any production flaws. 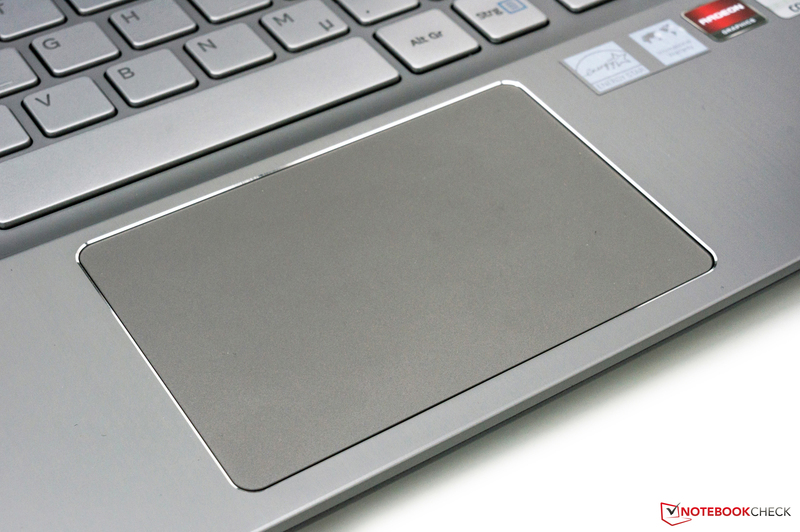 Above all, we found it great that the wrist rest and the area around the keyboard are made of one piece. The chassis' stiffness is satisfactory. However, the base unit yields visibly when stronger force is applied. Fortunately, yielding will not be an issue in everyday use. Thus, we will not deduct a point here. The display lid can be warped easily despite its aluminum cover. However, it does not cause waves on the screen in an activated state. The display's large hinge does its job reliably. Nevertheless, the lid's marginal rocking is a minor point of criticism. Overall, we deem the slim device's rigidness to be satisfactory. The ultrabook weighs 1.46 kilograms at a size of 32.4 x 22.4 x 1.75 centimeters (w x d x h). Consequently, it is within the same range as Asus' Zenbook Prime UX31A Touch or Dell's XPS 13 L322X. 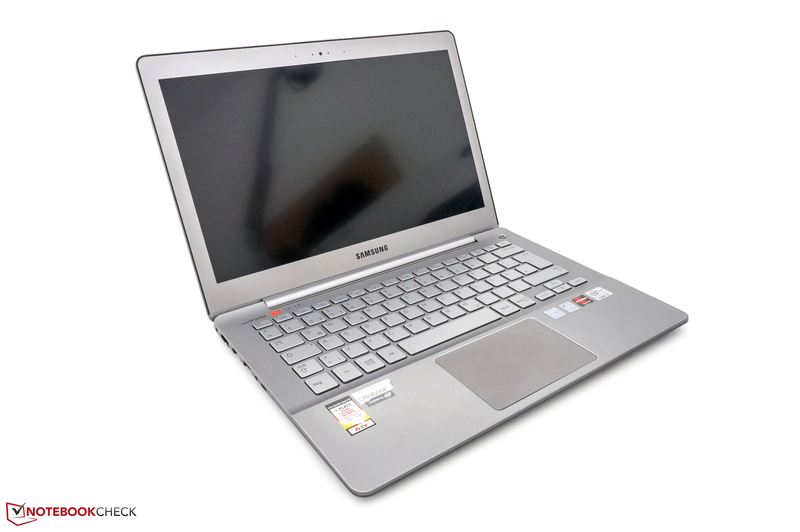 Samsung's Series 5 530U3C is a bit heavier with 1.64 kilograms. Examples for lighter members of this device category are Acer's Aspire S7, Samsung's Series 9 900X3C, Toshiba's Satellite Z930-119 and Apple's MacBook Air 13 Mid 2012. The sides of the ultrabook exhibit a quite large range of interfaces for this device category. At first glance, the port distribution is noticed favorably. Except for the card reader, the interfaces are at the back on both the right and left side. 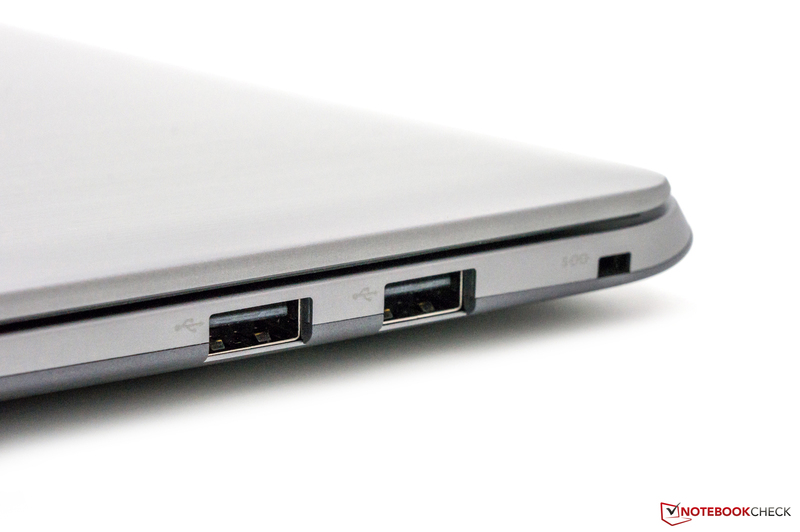 One USB 3.0 port is available for faster peripherals. The two other USB ports regrettably only support the 2.0 standard. An external monitor can easily be connected via HDMI. An optionally available adapter is needed for using the VGA port and costs around 30 Euros (~$39). It is not included in the scope of delivery. In addition to wireless connections, the user can also use a network cable. Installing a closable RJ45 socket cover was a good idea from Samsung. It looks good and keeps the cord in place. The communication options are extensive. A Gigabit Ethernet controller from Realtek ensures a decent cabled transmission performance. Intel's Centrino Advanced-N 6235 module takes care of wireless connections. It has two antennas and supports Bluetooth 4.0, Wireless Display (WiDi) and Wi-Fi standards 802.11 a/b/g/n with a maximum of 300 Mbit/s. Both the 2.4 GHz and 5 GHz band (dual-band) are supported. The Wi-Fi performance is middling when connected. We did not have problem in the apartment up to a distance of 10 meters. The speed decreases gradually beyond that. Connections were usually difficult one story below the router. It is recommendable to use a WLAN repeater to increase the router's range in a bigger house. The box does not contain any surprises. Besides the device, Samsung only includes a 60 watt power supply with power cord and printed documentation. Recovery media or images can be created via the preinstalled software. We would have at least expected a VGA adapter to meet the self-proclaimed premium claim because many projectors at work or university only have a VGA or DVI port. 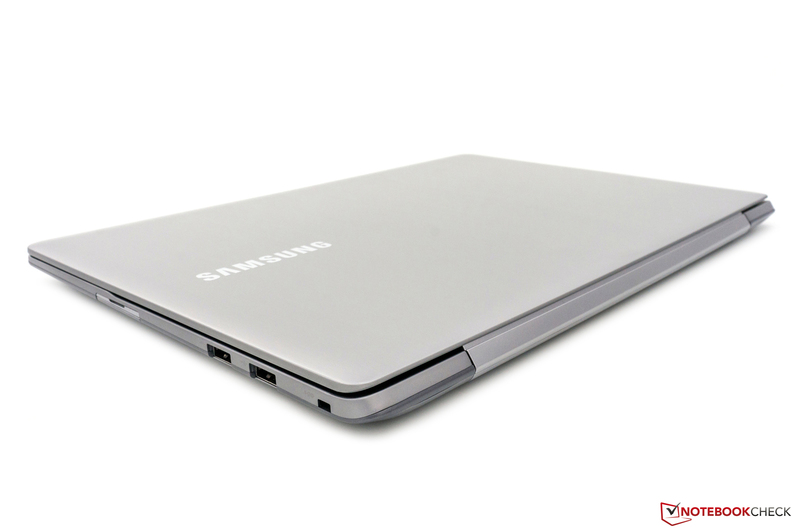 Samsung offers several accessories for laptops. Comparing prices is very often worthwhile. Fortunately, the hardware is relatively easy to access. A few screws have to be removed from the bottom first. The base plate is then only attached by small plastic hooks that are a bit tedious. However, releasing the plate is no problem with a bit of careful force. We again have to note in this review that we are not responsible for any undertakings performed by the reader. 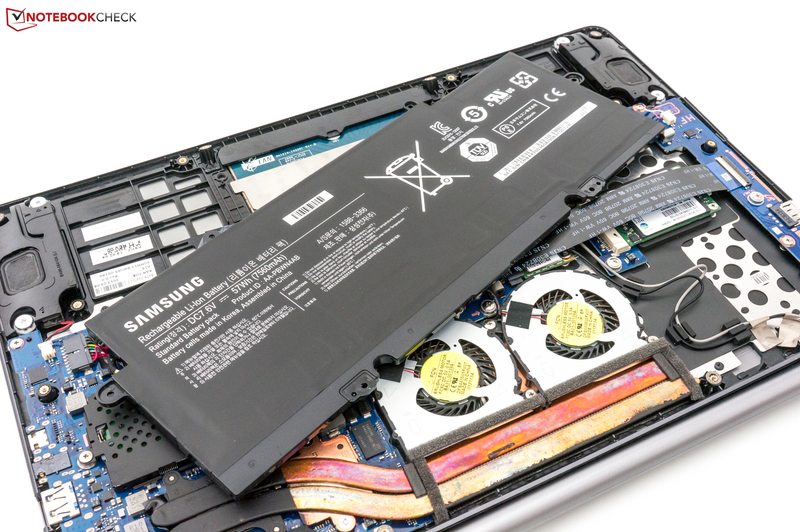 The ultrabook's innards are exposed after opening the device. 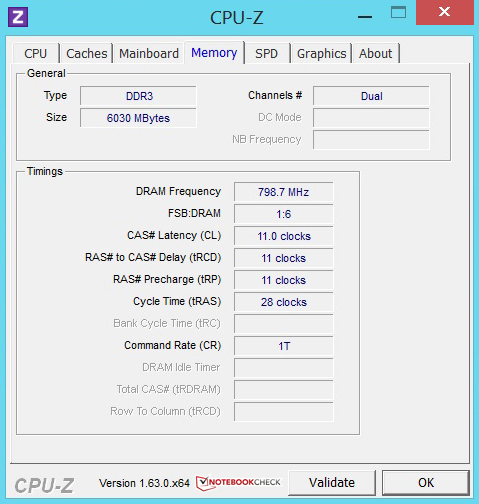 One DDR3 working memory slot is accessible. A 4 GB module is inserted ex-factory. The other 2 GB is soldered to the motherboard. Consequently, a maximum upgrade to 10 GB is possible. Most users should however be satisfied with 6 GB. 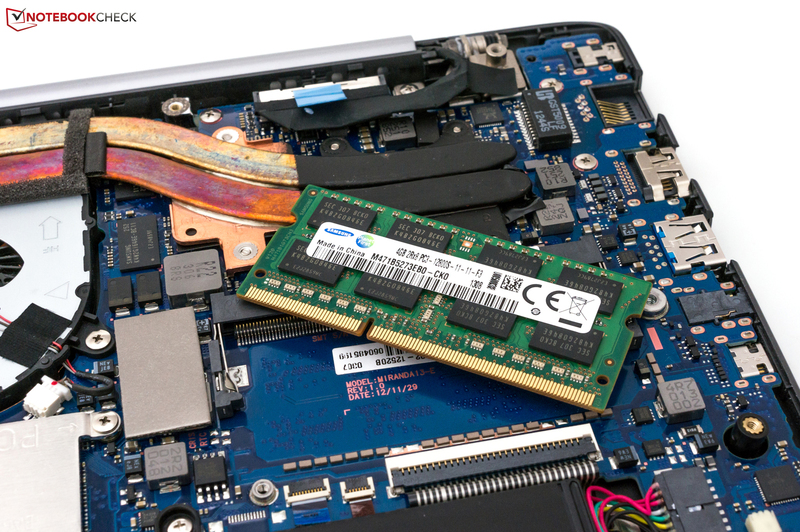 The SSD is on a small circuit board and replacing it does not make much sense economically. The device's maintenance-friendliness has to be highlighted. Both casing fans can be cleaned and the battery can also be replaced in case of damage. It is only secured by screws and not glued into the casing. Das Funkmodul von Intel unterstützt aktuelle Standards. Ab Werk ist ein Speicherriegel mit 4 GB integriert. Die Bodenplatte lässt sich relativ leicht entfernen. 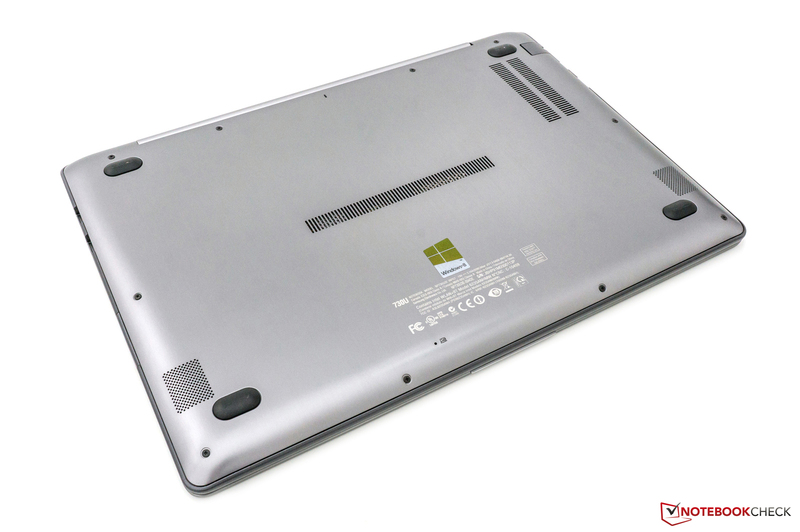 The ultrabook comes with a warranty period of 24 months ex-factory. This service can be upgraded to 36 or 48 months including an on-site service for a surcharge. Samsung does not state any prices on its product website. The input devices are known from former devices. 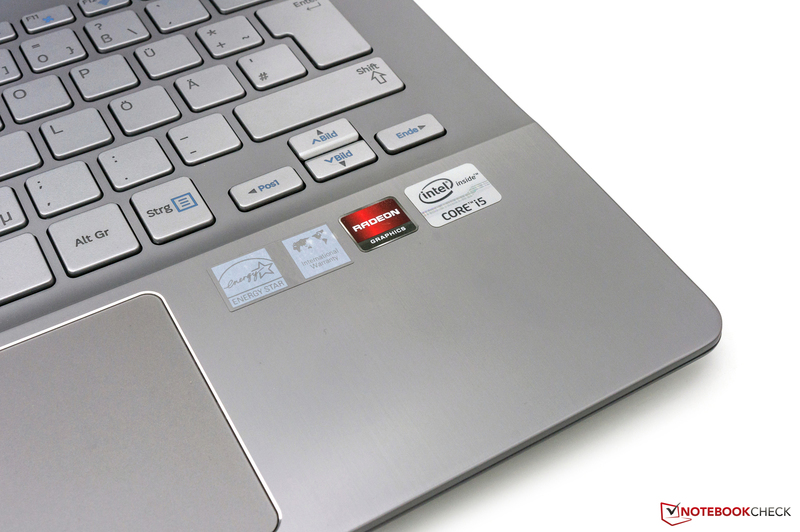 For example, the bigger Series 7 Chronos 770Z5E & 770Z7E laptops feature the same keyboard. However, ultrabook users have to live without a dedicated number pad because there would not be enough room for it. The chiclet keyboard's silver surface merges nicely into the overall appearance. The low noise development, the clear pressure point and the integrated backlight will satisfy prolific typists. 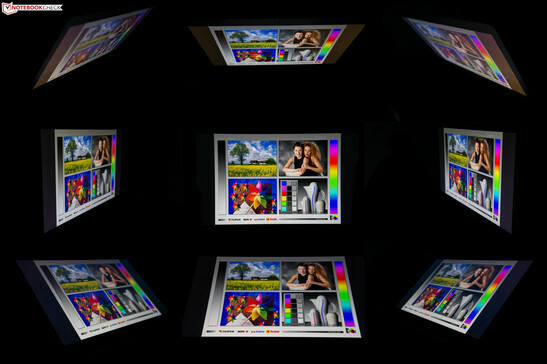 We added a picture of the four backlight levels below for comparison. The touchpad is also a familiar unit found in various Samsung laptops. It features a generous size of 107 x 77 millimeters (w x h). Besides the surface's good gliding traits, the Elan SmartPad particularly impresses with the extensive software alongside example videos. Using the various multi-touch gestures worked very smoothly. The mouse keys are integrated. The right mouse key is in the lower right corner and its activation can be set to tap-only when preferred. Großzügiges Touchpad mit guter Software. Full HD is fully in line with the trend. 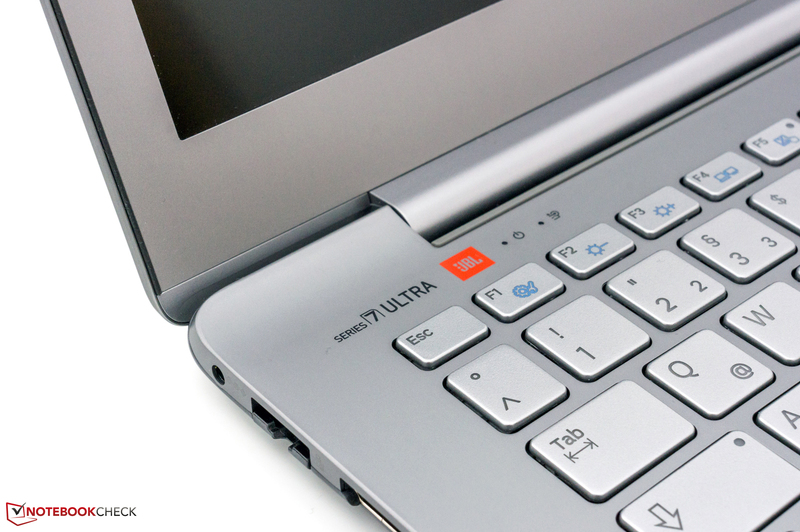 The 730U3E is no exception. A matte, 13.3-inch screen with a resolution of 1920x1080 pixels in a 16:9 aspect ratio is installed. To be precise, it is an IPS screen from the manufacturer Chi Mei Innolux with the model number CMN1343. Other laptops, such as Asus' Zenbook Prime UX31A or UX32VD, feature the same screen although from a different batch. Samsung optionally offers the Series 7 Ultra with a Full HD touchscreen. The model is called 740U3E-S02DE and is sold for 1549 Euros (~$2023, RRP). An in-depth review of this model will follow within the next days. We measured the screen using the X-Rite i1Pro 2 tool. The screen achieves a decent average brightness of 313 cd/m². Apple's MacBook Air 13 Mid 2012 is not as bright with a rate of 279 cd/m². We quite liked the performance of the 730U3E alongside the very good illumination of 92%. The black value is 0.52 cd/m². Owing to the decent brightness, the contrast ratio of 617:1 is also good. This is above average and impressive. The reproducible color spectrum is an important factor for professional users. 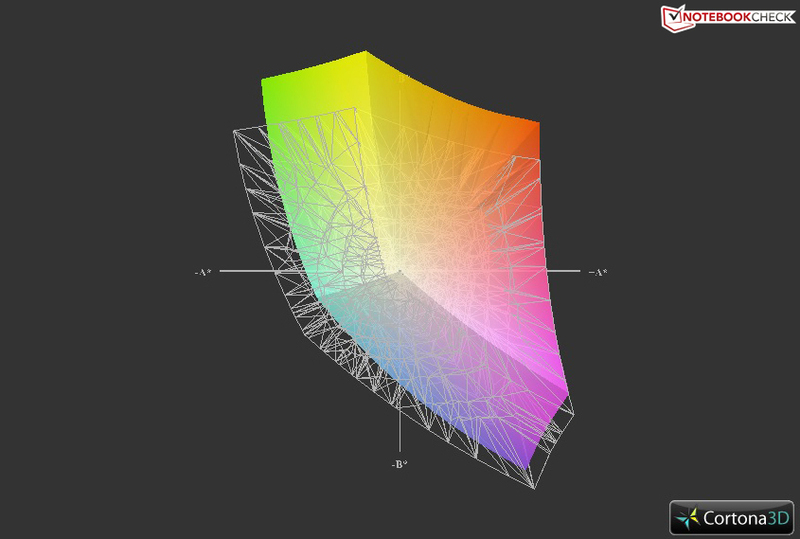 The screen cannot cover the frequently used sRGB reference. This clearly indicates that it is a premium device designed for consumers. There are no major surprises or deviations when compared with similar devices. Apple's MacBook Pro 13 that features a Retina screen is an alternative for photographers or layout artists who require a precise color reproduction. We additionally performed measurements using CalMAN 5 from SpectraCal prior to calibration (state of delivery). A clear deviation in cyan and green is noticed. A bluish cast is not visible and the overall picture is subjectively acceptable. Home users will very unlikely notice these details. 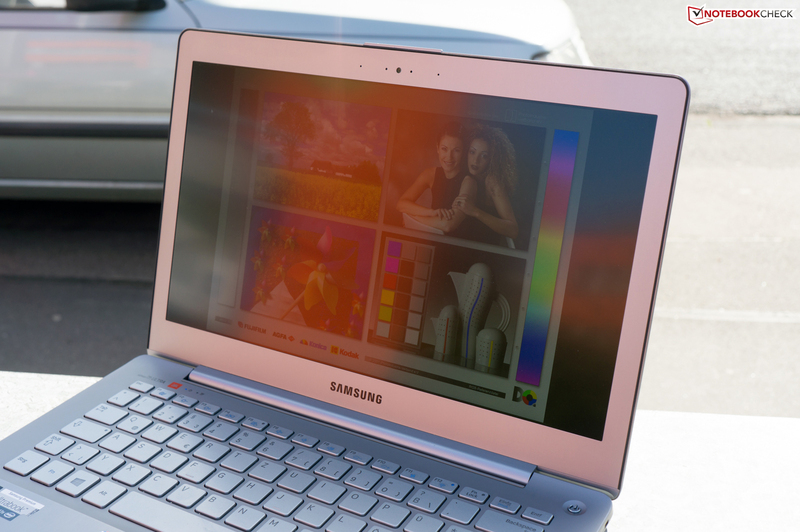 The screen's matte surface pays off in outdoor use. 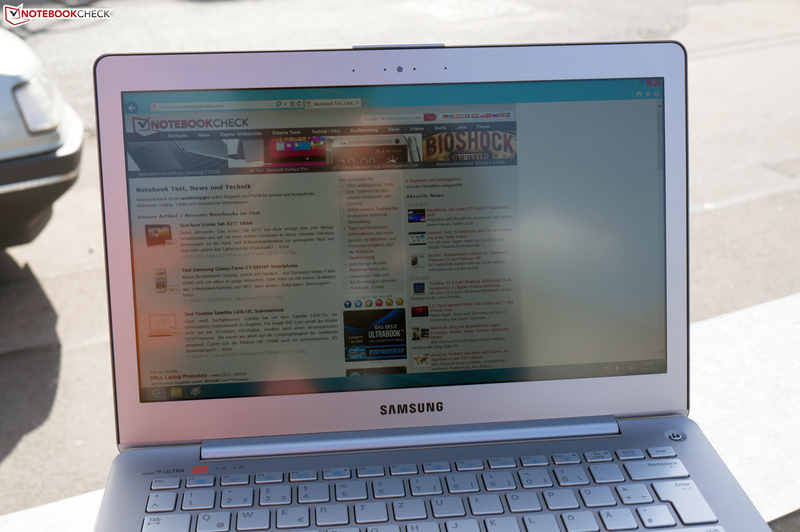 Together with the good brightness, the ultrabook can be used comfortably even in bright surroundings. However, the contrast ratio would have to be a bit better for a perfect result. Nevertheless, the 730U3E is impressive outdoors. Despite a similar contrast, the Series 9 900X3C scores with a stronger LED light. The viewing angles do not present any weaknesses. Owing to the IPS technology, inverting or fading is no issue vertically. A clearly visible brightness decrease is also not seen when looking from the sides. Cheaper laptops and ultrabooks featuring a simple TN screen often have problems in this test. 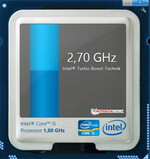 The 730U3E-S04DE model sports Intel's Core i5-3337U dual-core processor with a default clock of 1.8 GHz. 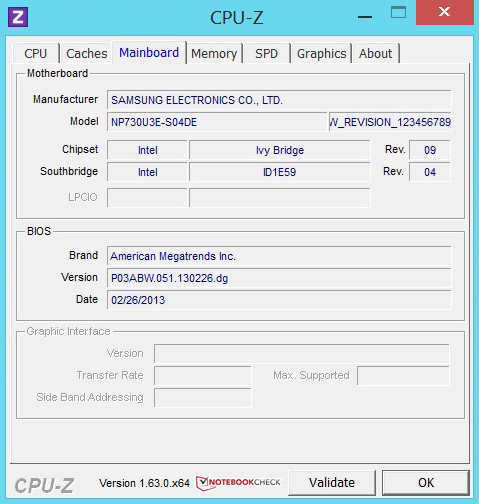 This CPU replaces the frequently used Intel Core i5-3317U. Up to 2.5 GHz when two cores are active and 2.7 GHz in single-core mode is possible via the incorporated Turbo Boost. This processor is an energy-efficient ULV model that is built in a 22 nanometer structure width. In addition to a 3 MB L3 cache and the integrated GMA 4000 HD graphics unit, the 3D transistors of the Ivy Bridge architecture are a crucial feature of this component. More computing power wanted? The 730U3E-S05DE and 740U3E-S02DE touchscreen models are powered by Intel's somewhat faster Core i7-3537U dual-core CPU. 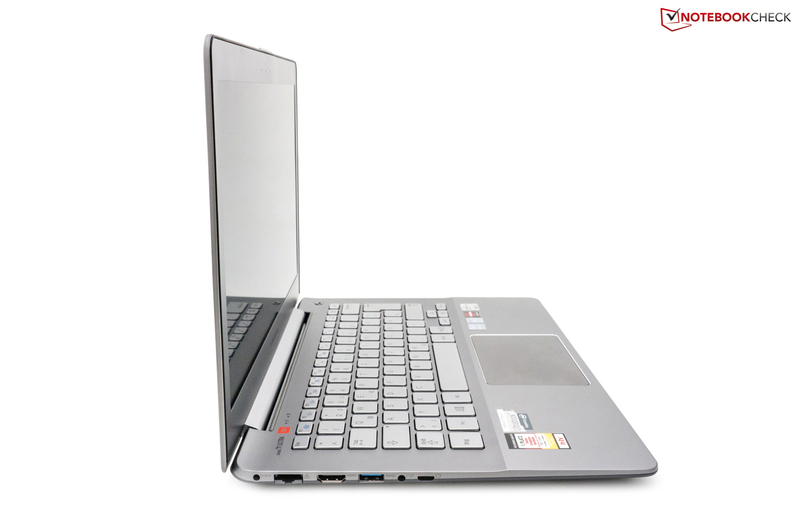 The 730U3E-S05DE currently costs approximately 50 Euros (~$65) more in online shops. We will also take a look at the CPUs' performance difference in the course of this review. First a look at the other equipment. The integrated graphics unit is supported by AMD's Radeon HD 8550M DirectX 11 midrange GPU. An SSD with a memory capacity of 256 GB alongside 6 GB of DDR3 working memory ensure good performance. A less expensive entry-level model with 128 GB is also available for a price of currently around 970 Euros, ~$1267 (RRP: 1099 Euros, ~$1436). Before we begin, we would like to take a quick look at whether the hardware throttles during load. We loaded the CPU with Prime95. No problems were recorded after about an hour of load. The processor clocked stably at 2.5 GHz with two active cores. 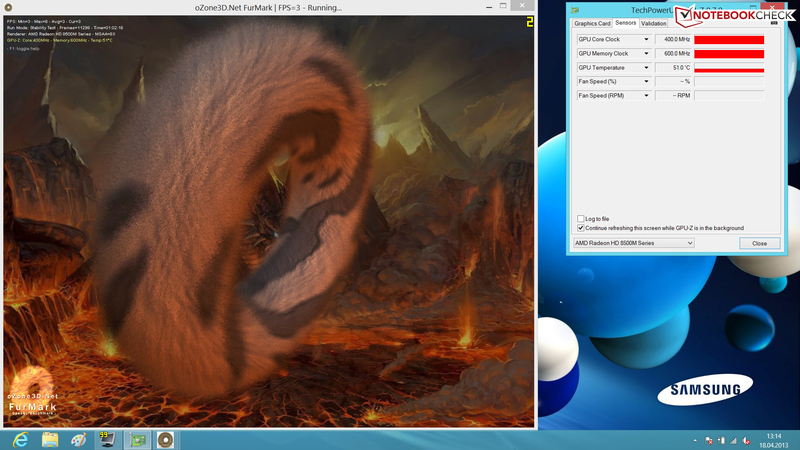 In contrast, the maximum is demanded from the GPU using Furmark. The performance also remained stable here. However, the curbed performance is striking. According to the specifications, AMD's Radeon HD 8550M can clock with a core rate of 700 MHz and memory rate of 900 MHz. In the case of the 730U3E-S04DE, Samsung seems to have moved a lever in the BIOS. The GPU only clocks with 400 MHz (core) and 600 MHz (memory). The ultrabook did not exhibit any problems with performance decreases in the stress test induced using both Prime95 and Furmark. The behavior without the limited performance of AMD's dedicated graphics card would be interesting. 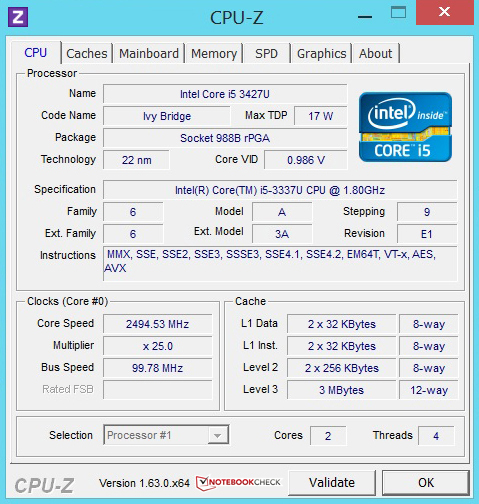 Intel's Core i5-3337U had to face the latest CineBench R11.5 to begin with. 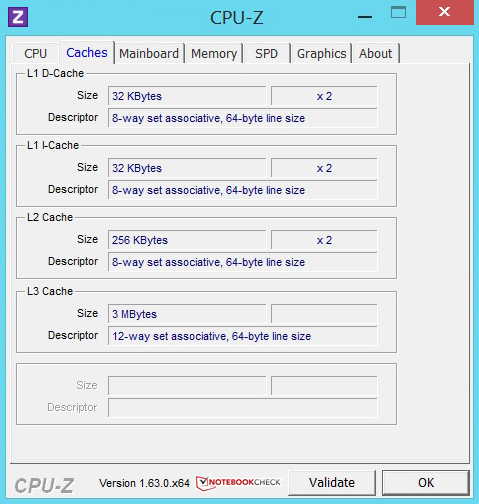 Our test device achieved a score of 2.49 points in the 64-bit multi-thread calculation. The result is within the broad midfield of our database. 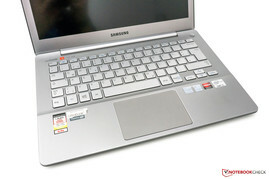 Laptops using the same CPU, such as Acer's Aspire TimelineU M3, Samsung's Series 5 530U4E and Toshiba's Satellite L830-15L, are in its direct vicinity. The direct precursor, Intel Core i5-3317U for example in Apple's MacBook Air 11 Mid 2012, is approximately 3% slower with a score of 2.41 points. A marginal difference that is barely noticed in routine use. 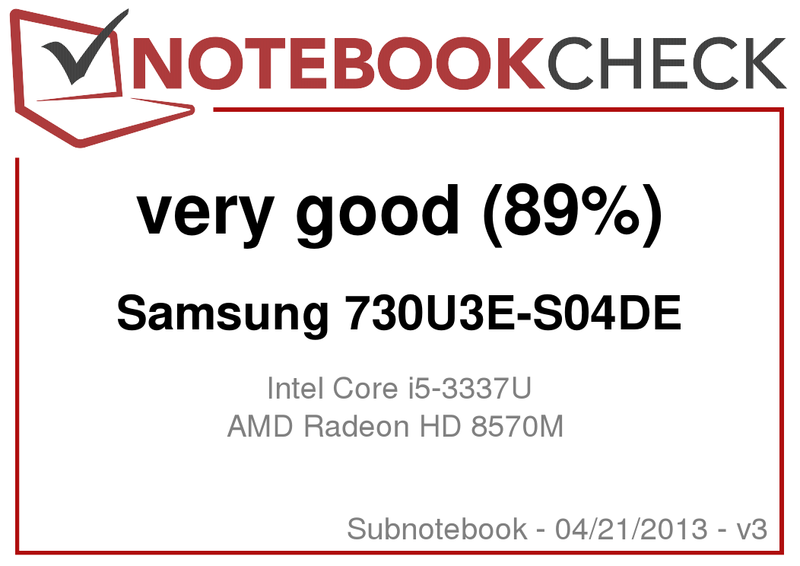 We have not yet had Intel's new Core i7-3537U in review. Intel's Core i7-3517U precursor scores 13% higher (2.82 points) compared with Intel's Core i5-3337U. The small surcharge of 50 Euros (~$65) for the 730U3E-S05DE could prove to be quite worthwhile for users who work with video editing applications and the like. 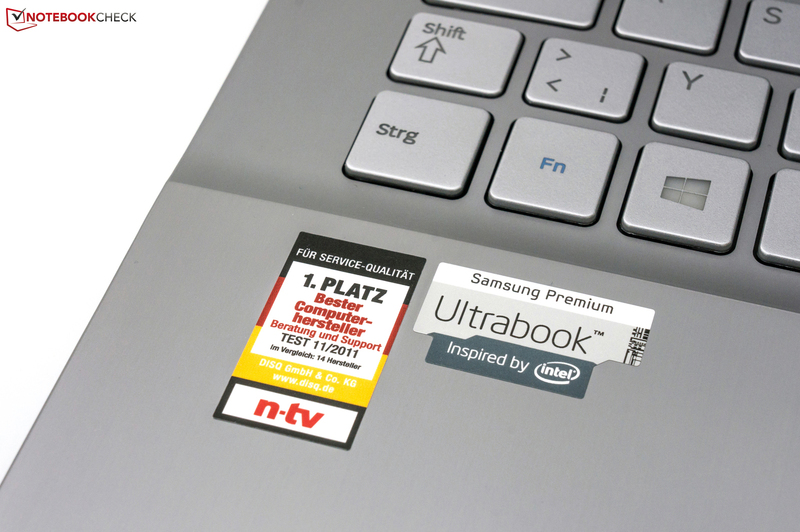 The ultrabook achieved a score of 4711 points in Futuremark's PCMark 7 and places itself in the upper third of our database. Besides the processor and graphics unit, the solid state drive particularly has an impact on the score here. The test device is in the area of, for example, Dell's XPS 12 Convertible, Asus' G75VW-T1040V gaming laptop and Asus' Taichi 31. The score is much lower with the same CPU and conventional hard drive. For example, Toshiba's Satellite L830-15L only accomplished 2046 points, which is a difference of 57%. The system's performance was also subjectively convincing. Programs were loaded quickly, system start only took a few seconds and there were no lengthy delays. Samsung relies on a 256 GB solid state drive from its own production line for storage. The model MZMTD256HAGM from the PM841 range is not enclosed in a casing, which saves room, and is implemented on a small circuit board. 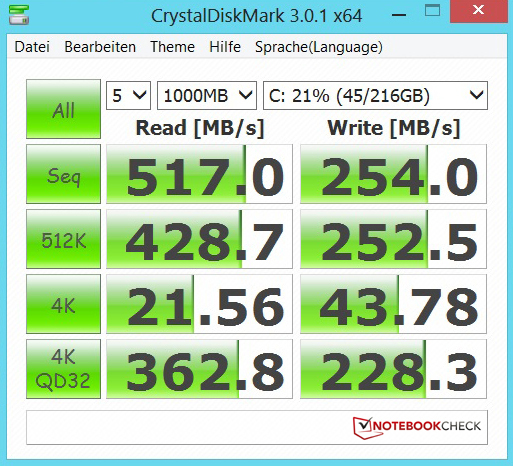 In CrystalDiskMark the storage device achieved a compelling transfer rate of 254 MB/s in write and 517 MB/s in read. Its biggest advantage over a conventional hard drive is the short access time. 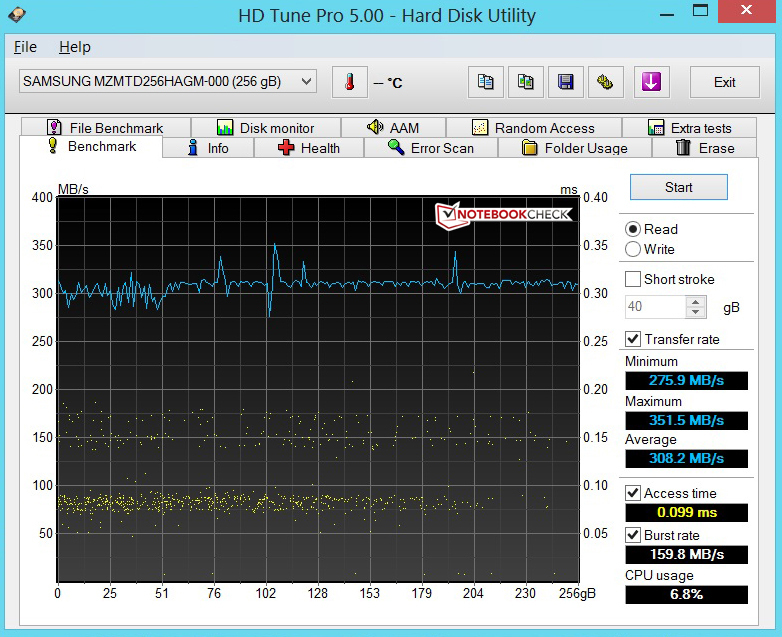 HDTune and AS SSD recorded a very low rate of approximately 0.01 milliseconds. Hard drives usually need between 16 and 24 milliseconds on average. AMD's Radeon HD 8550M first has to run through the synthetic benchmarks. The GPU is based on a GCN core that is built in a 28 nanometer structure width. 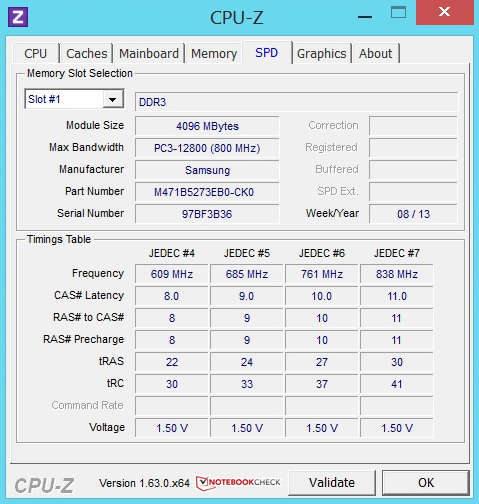 The dedicated graphics unit clocks with a core rate of 400 MHz and memory speed of 600 MHz that is connected via a 64-bit bus in the 730U3E-S04DE. Depending on the application and personal settings, the system automatically switches between AMD's graphics unit and the integrated GMA HD 4000. AMD calls this function Enduro. The GPU reached a score of 1364 points in 3DMark 11. Laptops with Nvidia's older GeForce GT 555M or GeForce 640M LE are in its direct vicinity. There is a lot of room to the top though. Ultrabooks that feature Intel's integrated GMA HD 4000 graphics unit score about 45% lower in this benchmark. This is an argument for the GPU installed in the 730U3E. The gaming performance did not convince us. New games could often only be rendered smoothly in minimum settings. A low 14.7 fps was possible in BioShock Infinite using a resolution of 1366x768 pixels and medium pre-settings. That naturally does not result in gaming fun. 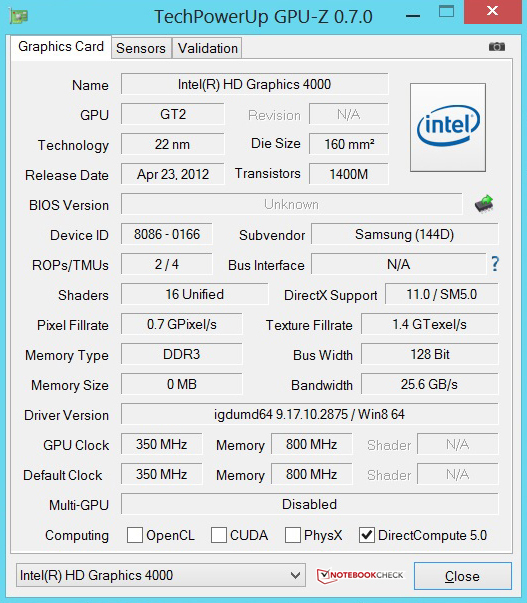 Samsung's Ativ Smart PC with an integrated GMA 4000 graphics unit only achieved 10.7 fps in these settings. That is a difference of 27%. AMD's Radeon HD 8550M coped better with undemanding games, such as FIFA 13, World of Warcraft or TrackMania. However, the ultrabook is not the ideal solution for users who occasionally want to play a game in a pleasant resolution. It is more of a stylish workhorse with focus on multimedia applications. Only the two casing's fans are left as a source of noise because an SSD is installed. They remain unobtrusively in the background with a maximum of 32.2 dB(A). We measured a rate of 29.9 dB(A) in idle. The fans were however never inactive in this state. They spin at a low speed as, for example, known from Apple's MacBook Pro 13 with a Retina screen. The fans increase speed during load because the produced waste heat has to be discharged. We measured a maximum of 38.2 dB(A). The fans maintain this level stably during load. Another plus point is the quick speed decrease after work. The aluminum surfaces' cool feel are an advantage in idle mode. The wrist rest always had a pleasant temperature. We measured a maximum of 27.5 °C in this area. The other idle temperatures were also compelling. A peak rate of 30.5 °C underlines the combination of efficient hardware and a good cooling system. The casing partly heated up noticeably during load. The temperature difference was quite perceptible on top of the keyboard. The temperature decrease from left to right can also be seen in the blue area of the chart. However, the warmer keys on the left are not really distracting in practical use. We have to mention the wrist rest positively in this scenario because it only heats up marginally. (+) In idle usage, the average temperature for the upper side is 28.2 °C / 83 F, compared to the device average of 30.7 °C / 87 F.
The ultrabook sports two JBL speakers with an output of two watts each for audio rendering. The sound made a good impression. It was quite balanced but bass and low pitches could be a bit more differentiated. The sound quality did not decrease in maximum volume. For best results, the device should be placed on a solid surface because the speakers are aligned to the bottom. Basically, there is nothing in the way of movie entertainment using this solution. Peripherals can be connected to the 3.5 mm stereo jack (headphone and microphone combo) or HDMI port. The transmission quality of both ports is very satisfactory. The system uses the ULV processor's integrated graphics unit for office tasks. The consumption rates are correspondingly low. Depending on the load, the 730U3E consumed between 6.5 and 12.1 watts in this test. Thus, it is within the expected range for this size and device category. The consumption increased up to 41.5 watts during load when AMD's graphics was active. This peak rate is not unusual either. The included 60 watt power supply has enough reserves. In view of this, it was perhaps unnecessary for Samsung to limit the GPU's performance. An integrated lithium-ion battery with four-cells and 57 watt hours opposes the consumption for mobile use. It is to ensure good runtimes. Fortunately, it is easy to replace the battery since it is only secured with screws. However, the battery cannot be directly accessed. Battery Eater's Reader's test simulates reading a text document in minimum brightness and with enabled power saving features as well as disabled wireless technologies. The battery was completely drained after 9 hours and 40 minutes. That is an average result for an ultrabook. Asus' Zenbook Prime UX31A lasted for 10 hours and 48 minutes. Apple's MacBook Air 13 Mid 2012 also achieved a runtime of roughly ten hours. Dell's latest XPS 13 didn't last as long with 8 hours and 32 minutes. The Classic test is the other extreme. It loads the hardware using maximum brightness and enabled wireless modules. 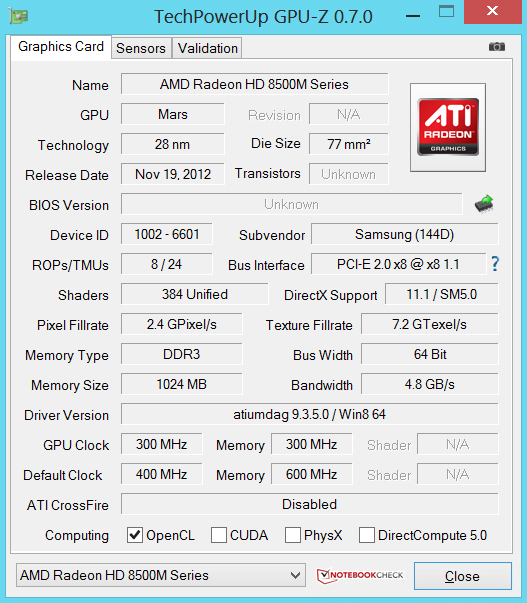 AMD's dedicated Radeon HD 8550M graphics unit was active in this test. The ultrabook had to be reconnected to the mains after 2 hours and 24 minutes. This is not very surprising in view of the configuration. Asus' UX31A was on a par in this test. The MacBook Air 13 and Dell's XPS 13 did not last for two hours here. The assessment "Wi-Fi browsing" is a realistic average value. A different internet site is opened every 40 seconds using a standardized brightness of 150 cd/m². 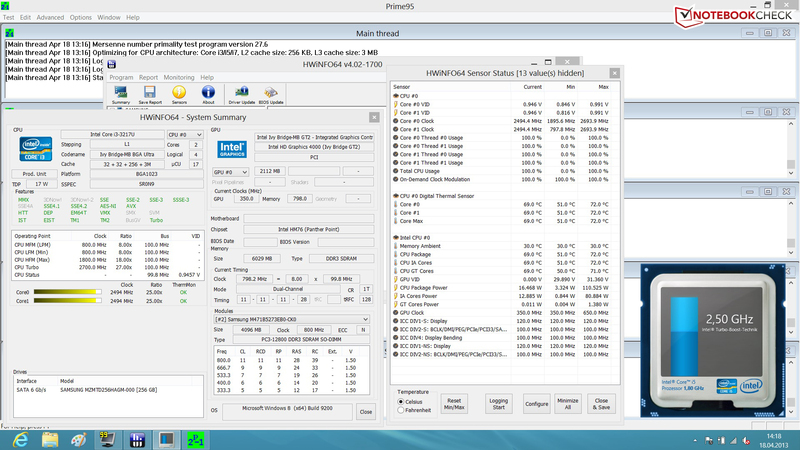 The 730U3E-S04DE achieved a runtime of 6 hours and 20 minutes alongside Intel's GMA HD 4000. This is a good result compared with the aforementioned devices. The battery runtime will likely decrease to about five hours in maximum brightness. 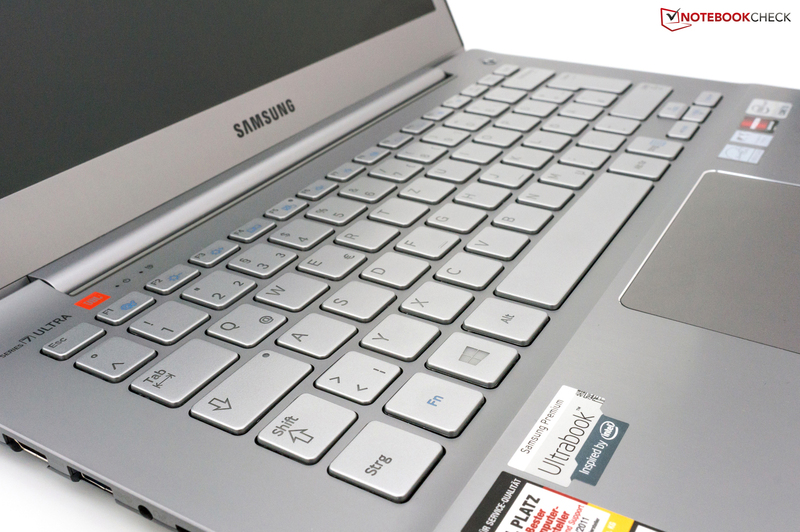 Samsung's Series 7 Ultra 730U3E-S04DE is a compelling ultrabook in a stylish casing. Build, rigidness and the feel of the slim aluminum device is convincing. It features decent connectivity although Samsung could have installed USB 3.0 standard only. We would also have at least expected a VGA adapter among the accessories of a premium device. Maintenance and upgrades are agreeably easy via the base plate. The input devices are a crucial factor for prolific typists and should be considered before buying. In this case, Samsung makes the right choice and installs familiar components alongside a backlight. 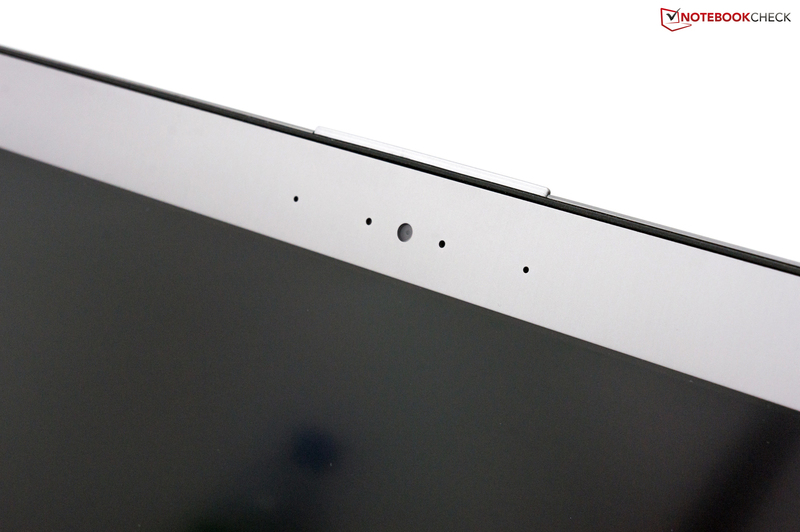 A key feature is the matte 13.3-inch IPS screen with a resolution of 1920x1080 pixels. The rates make a good impression. 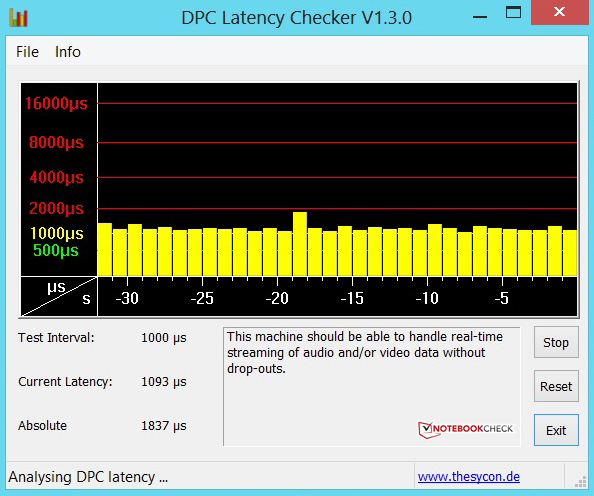 The performance of the configuration we tested is compelling. However, one drawback is definitely the curbed performance of AMD's Radeon HD 8550M graphics unit that consequently cannot develop its full potential. Gamers are left unsatisfied in this case. The device is more the multimedia ultrabook that Samsung promises. The good JBL stereo speakers underline this. The 730U3E also reaps in plus points with low emissions and acceptable battery runtimes. It adds up to an effective duration of five to eight hours depending on the usage. The buyer gets a convincing ultrabook for a price starting at 970 Euros (~$1267, S03DE). Whether the touchscreen model (740U3E-S02DE) is worth the surcharge can soon be read here, at Notebookcheck. The display lid is thin and not particularly stiff. 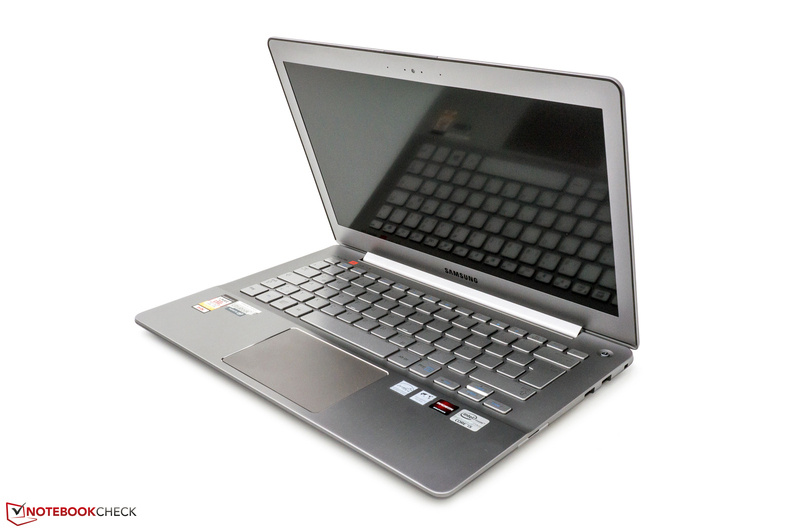 730U3E-S04DE: Core i5, Radeon HD 8550M & 256 GB SSD-storage. The Series 7 Ultra is above the devices from the Series 5. 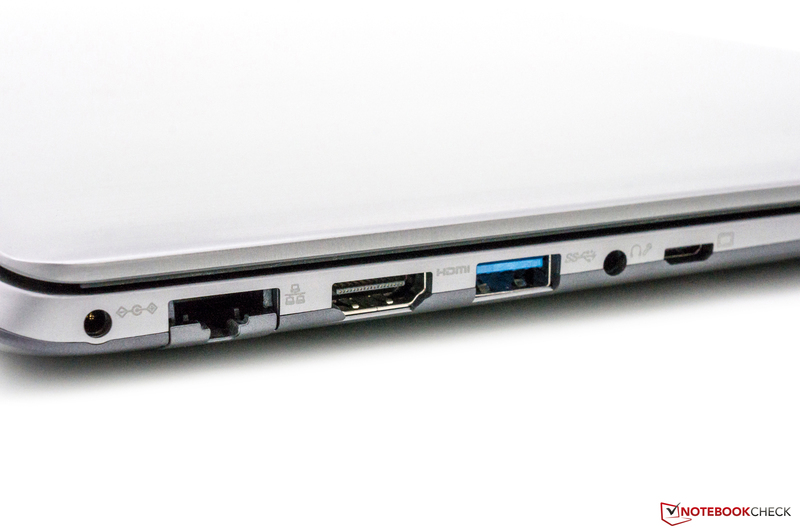 Up-to-date connectivity including USB 3.0 is on board. However, only USB 2.0 ports are on the opposite side. A silver, chiclet keyboard featuring an integrated LED backlight. The extensive touchpad software is impressive. A tightly pulled display hinge. It allows rocking to a minor extent. The quality of the 720p webcam is sufficient for normal video chats. JBL speakers also ensure good sound in this device. The speakers are located on the ultrabook's bottom. Opening the chassis is not difficult in this case. Cooling system: two casing fans and copper heat pipes. Together, the 2 watt speakers render an acceptable sound. 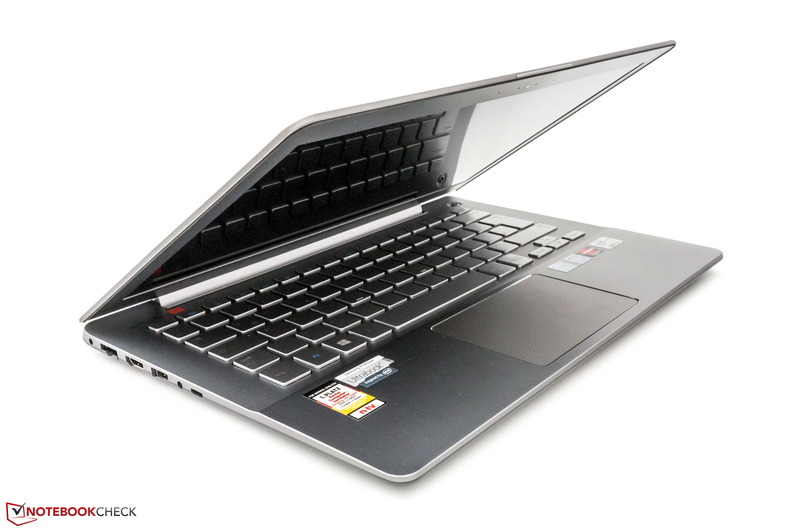 The lithium-ion battery in the 730U3E supplies 57 watt hours. 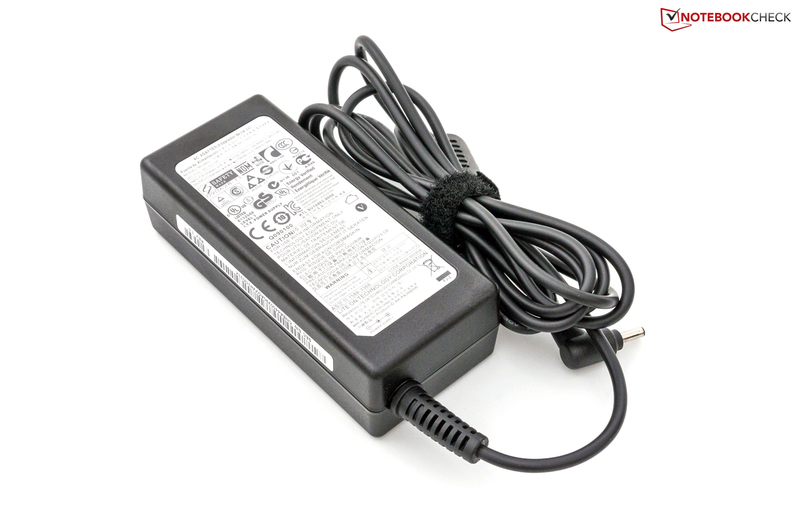 A 60 watt PSU is part of the scanty accessories. + Very good application performance. The stylish design, choice of materials and build as well as the matte IPS screen with a Full HD resolution of 1920x1080 pixels. The full power of AMD's dedicated Radeon HD 8550M graphics unit. Otherwise, the 730U3E-S04DE does a good job. That Samsung also draws on unlimited resources in these devices and thus successfully avoids major blunders. The Korean manufacturer's experience pays off in this case. Dell XPS 13, Asus Zenbook Prime UX31A, Toshiba Portégé Z930-105, Samsung Series 5 540U3C, Acer Aspire S7, Apple MacBook Pro 13 Retina, MacBook Air 13 Mid 2012 or Samsung Series 9 900X3E.